Kismet has been installed and launched successfully, we can now study how to use it. Data taken from the Kismet documentation is displayed in italic. 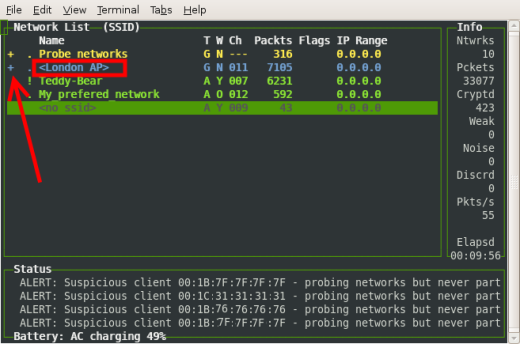 By default the SSID, you can change it to another name. Give a brief overview about information discovered on the network. You can remove or add columns in the Kismet main interface by changing the "/etc/kismet/kismet_ui.conf" file. See details. Red: Factory default settings in use! When SSID Broadcasting is disabled, unless a client knows the correct SSID, it cannot join the network. 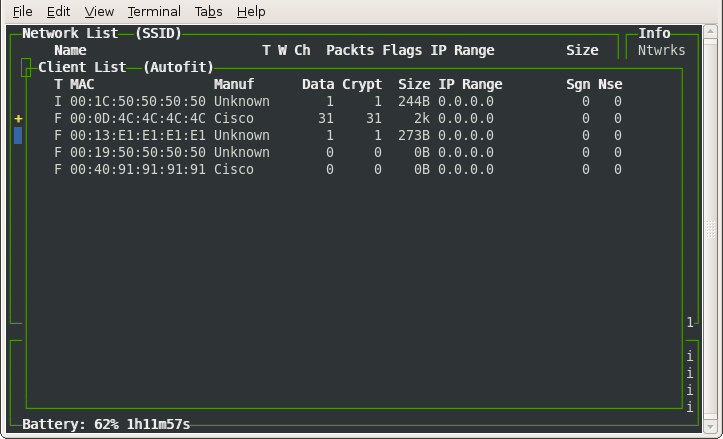 Remember that SSID broadcasting disablement does not offer a security protection. Check the "Wireless and Security" section for full details. 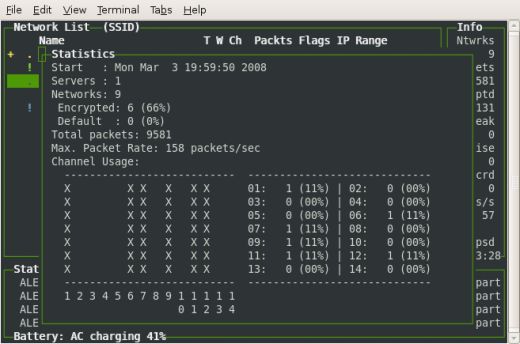 Ntwrks (Networks): Wireless Network List. 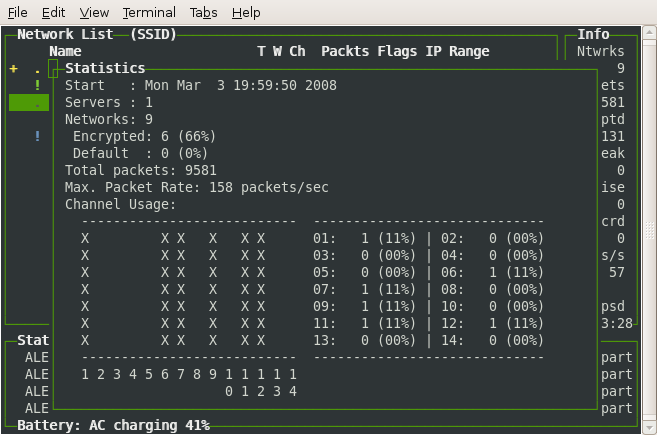 Pckets (Packets): Total number of packet captured. Weak: Initialization Vectors that reveal information about the WEP key. Pkts/s (Packets per second): Average Packets per second. 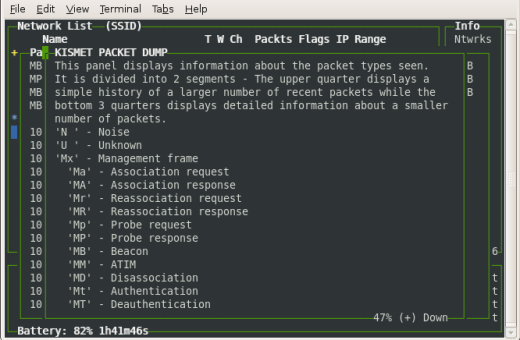 Provides a log about the Kismet and wireless events. At any time you can hit "h" to get help. Below, Kismet main interface help. Help called from a pop-up window. 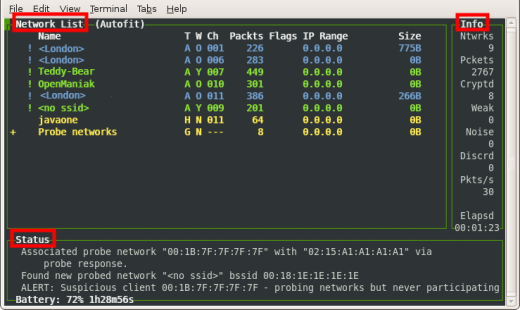 Displays only the "Network List" pane. The "info" and "status" panes are hidden. 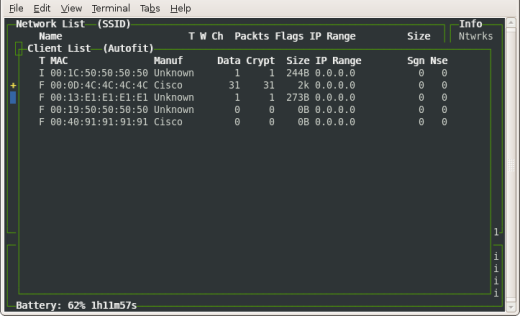 Why is a wireless network displayed as "no ssid" ? 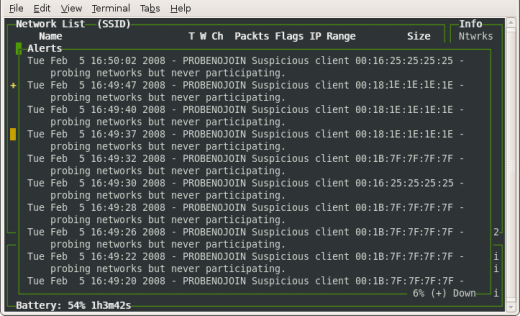 Because Kismet detected a network that does not broadcast its SSID and does not exchanging any data. Remember that even an AP hides its SSID, kismet is able to see the SSID when exchanges occurred between a client and the AP because the SSID field contained in wireless management frame travels in clear text. - Kismet servers (A Kismet client can connect to several Kismet servers). 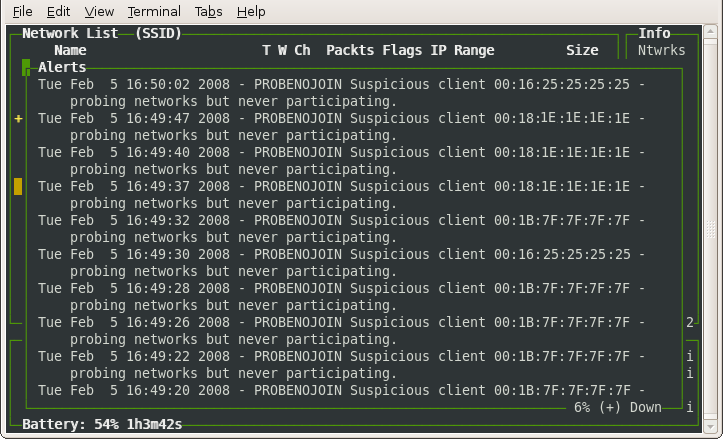 Displays the alerts messages. This information is also displayed in the "status" pane. 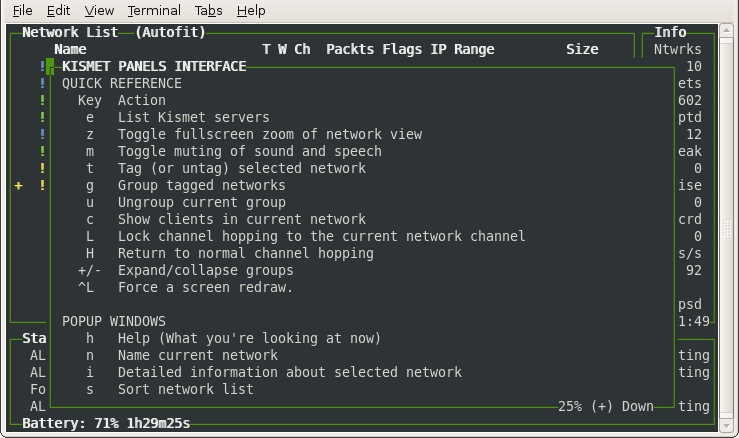 Displays a list of the available Kismet servers. 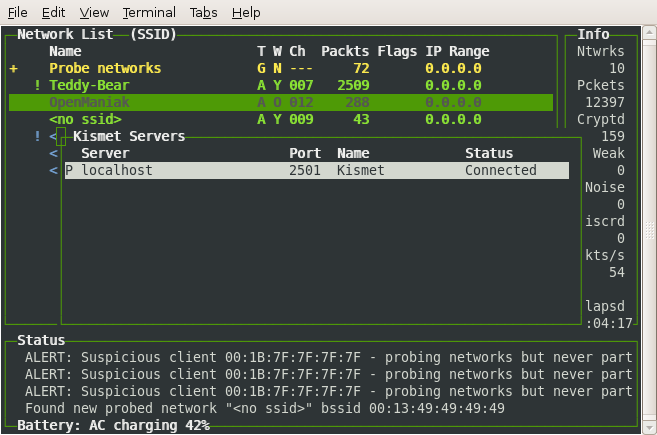 Kismet supports monitoring data from several servers simultaneously. When connected to mulitple servers, only servers which are tagged are displayed. Before being able to scroll and select the different wireless networks, you have first to sort the networks by pressing on the "s" key. We selected to sort by the ascending SSIDs. ("s" Key). The sorting method is indicated next to "Network List". 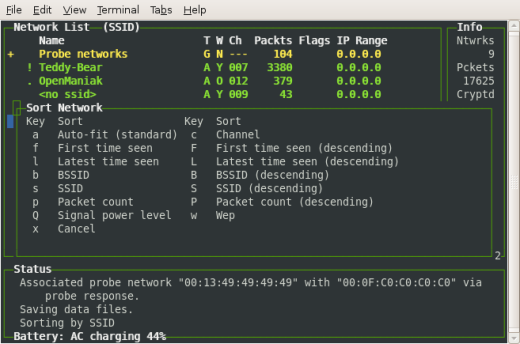 It is now possible to select the different wireless networks. 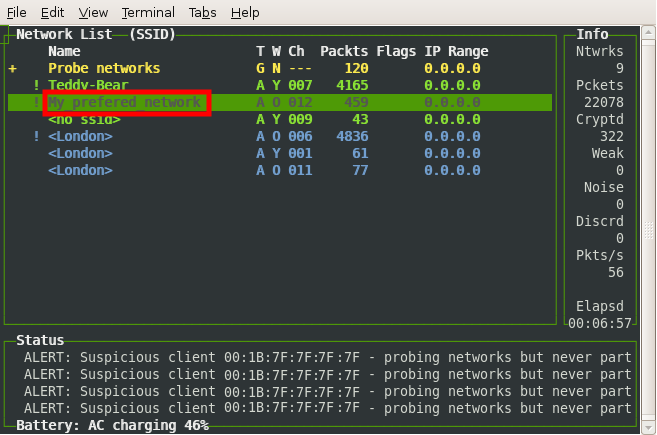 The selected network is highlighted. 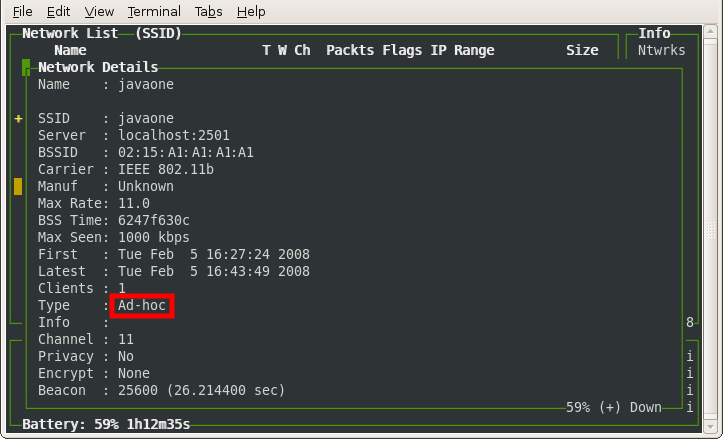 By default, the discovered wireless networks take the name of their SSID. If you want to rename a network, select a network and press on the "n" key. 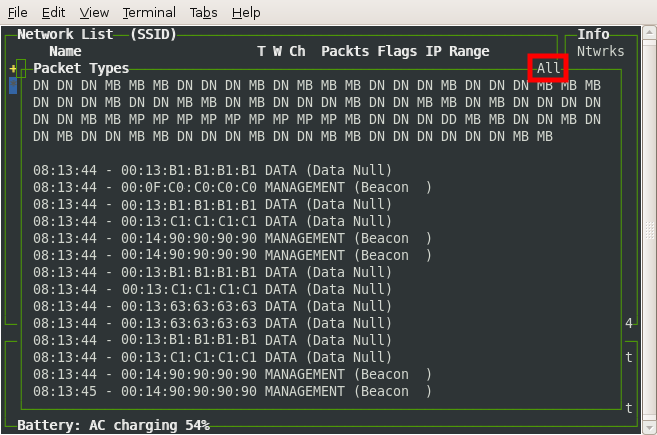 To tag a network, select a wireless network with the "up" or "down" arrows and press on the "t" key. 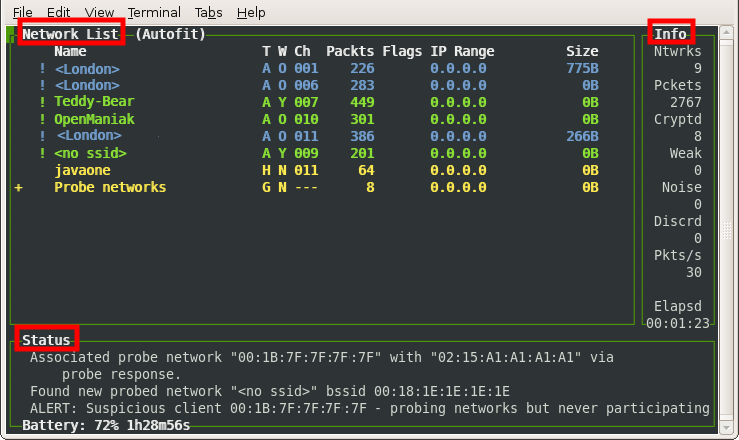 An asterisk appears at the left of the tagged networks. Tagging can be used to select networks to create groups. 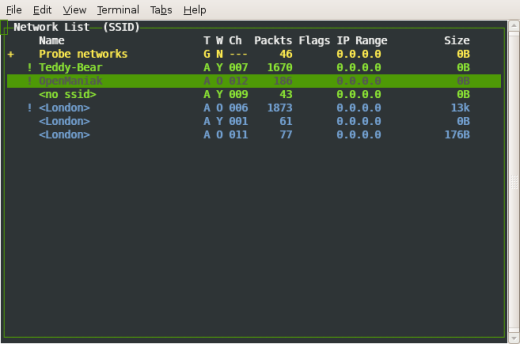 Wireless network can be grouped together. You have to tag first the group members (see below) and then press on the "g" key to create and name the group. The "+" sign indicates a group. To get detailed wireless information, select a network and press on the "i" key. The example below shows an access point details. Also check the introduction page for details about wireless key words. 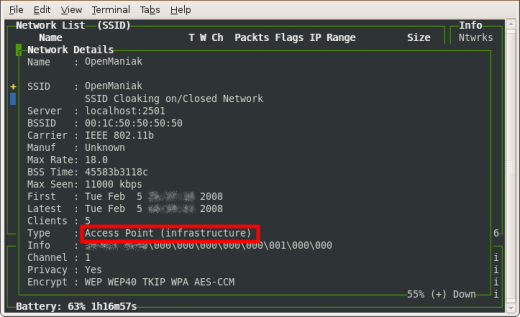 The example below shows details about a wireless client in an Ad-Hoc network. Also check the introduction page to get definitions about wireless key words. 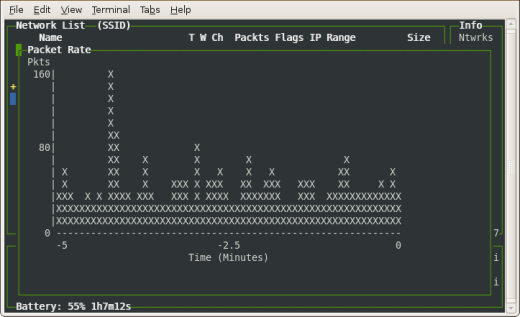 Provides the rate in packets per second. Press the "p" key to see the Wireless frames. You can press again on "p" to pause the capture. You can then press on "t" to see only tagged frames. 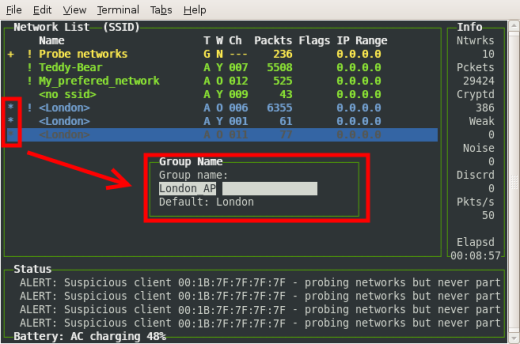 See how to tag a network. 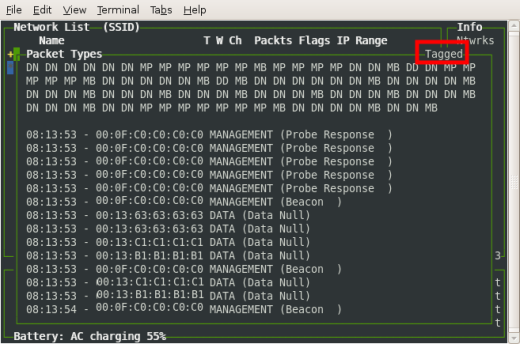 Check the 802.11 section to get full details about Wireless frames. In an idle wireless network, beacon frames (MB) dominate all other traffic.